The desire to transform their living space and make it as comfortable as possible makes the owners of city apartments think about the effective use of every centimeter of space. Balconies and loggias fell under the transformation, but these additional meters to the apartment have only a floor and a low fence. To make it cozy and comfortable here, it is necessary to put a lot of effort into it. Before you sheathe the balcony with your own hands, we recommend reading our instructions. For finishing a balcony or loggia from the inside, materials differing in texture, appearance and characteristics are used. We will talk about some types of plating that can be done independently, without involving a team of professionals. 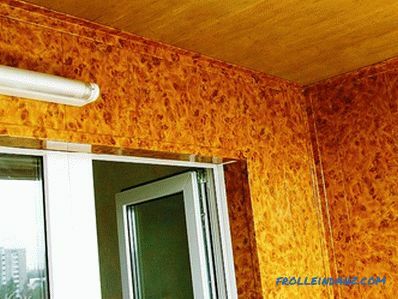 For the interior decoration of loggias and balconies, all types of wooden wall paneling, plastic panels of various textures or MDF panels are mainly used. 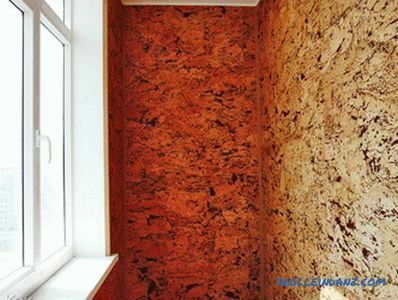 When applied as a finishing decorative coating of stone, various types of plaster or tile, you need to choose good sheets of plasterboard for the base. Unusually look beautiful balconies, decorated from the inside with decorative plaster of different structure, block house, cork panels, or so similar to natural material artificial stone. These materials are extremely beautiful and of high quality, but their price level is not available to everyone. A large selection of textures and colors. The material is safe for human health - completely non-toxic. 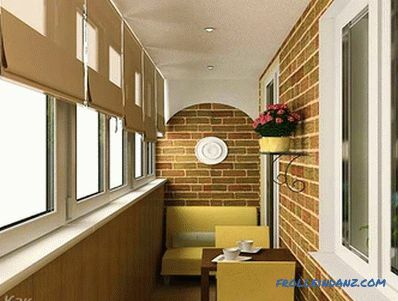 Plastic-lined walls will delight you with their perfect look for a long time. Accuracy and accuracy of work - the guarantor of excellent quality plating. Step # 1 . Mounting crates from wooden bars. Install the crate on the wall in the same plane. To check the quality of the attachment, use a level. Step number 2 . Warming the balcony. 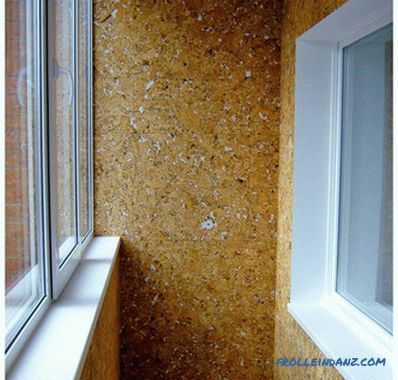 It is necessary to lay mineral wool or foam plates between the bars for thermal insulation. Step number 3 . 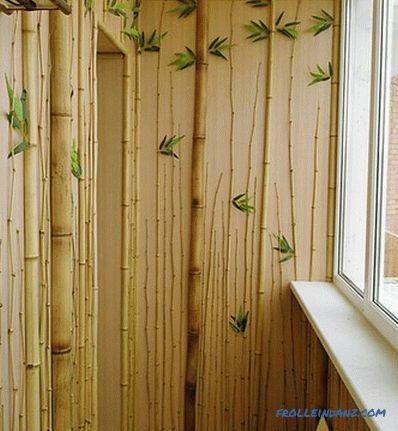 Proceed to trim the wall on which there are no openings. Begin work with installation of a U-shaped box with sidewalls of different sizes. The wide side must be attached to the crate. The box layout is vertical. The top box is attached to the ceiling base, and the bottom - to the floor covering. It’s time to assemble the panels. The first part of the trim a little bend and insert into the box. Without haste, slide the trim to the starting box. With effort, push the trim element into the box. When you hear a click, the panel locks into place. Attach the stapler to the installed crate. If desired, mounting can be done with mounting clips. 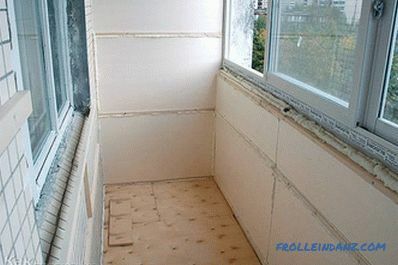 Install all panels, completely covering the wall. 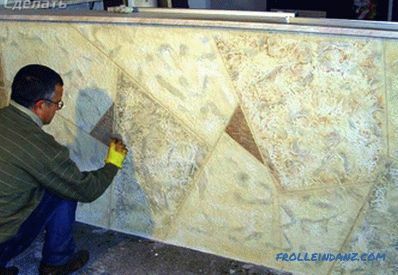 The last panel fix the finishing profile, characterized by a larger depth. Step # 4. Sheathing door and window openings. Work at this stage is slightly different from the previous step. Install the panels from the opening into the corner. After that install both U-shaped profiles. Continue to work until complete. Molded board in standard form. The unusual form of the house block is used much less frequently than other types. Especially in demand for interior work is a material that meets European standards, made from softwood, oak, ash, linden or alder. According to the price level and the best quality products are made of cedar and oak. More available pine, linden and spruce materials. 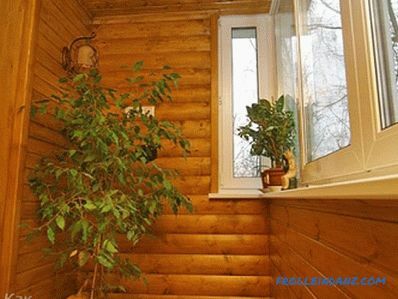 The use of pine material is advisable only when the balcony windows are located on the north side. Under the influence of the rays of the sun on the walls of pine clapboard, resin evaporations begin to stand out. A fine-toothed hacksaw for wood. Drill bit set and drill. Step # 1 . Start by installing the crates.Be sure to check the correct location of the bars. Important! Bars for lathing are positioned vertically for works with horizontal or diagonal lining and horizontally for vertical installation of the lining. Step # 2. Do not forget to put heat-insulating material between the elements of the batten, and on it a layer of film for vapor barrier. Step number 3 . 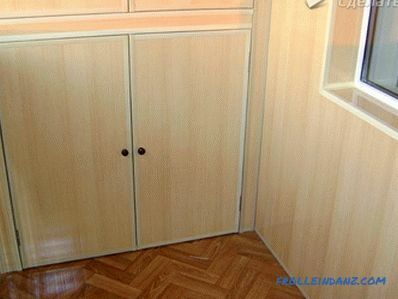 It is time to start finishing the room with eurolining. Sheathing lining balcony is not as complicated as it may seem at first. The main thing - the desire to achieve a good result and a little patience. 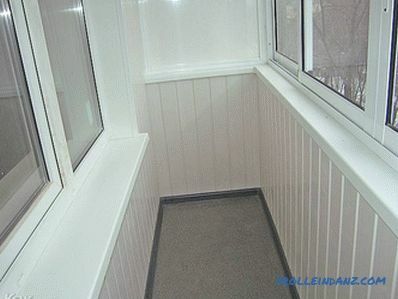 Select one corner of the balcony and get to work. The comb of the first part you are installing should be pointing towards the corner. To check the correct location of the skin element, use a level. The location of the material is vertical. Using small nails, attach the part to the crate through the lower part of the groove. Continue mounting until you completely close the wall. Most likely, the last part you have to trim to the desired width. Start the cut sheet at an angle to the previous one and press down firmly. Sheet necessarily fit into place. Narrow the narrow slots in the corners with a neat simple baseboard or batten. 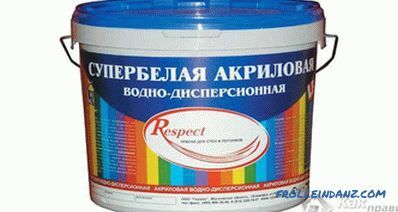 Prevent the fungus from covering the balcony. 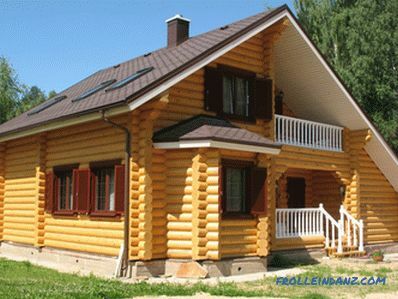 All wooden parts must be treated with polyvinyl acetate putty, completely harmless to human health and perfectly protecting the tree from fungus. 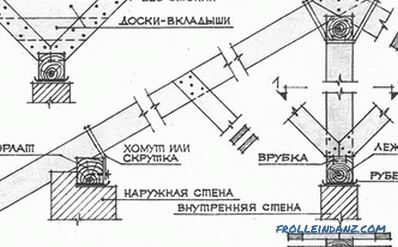 To fix the sheets, you first need to make the frame of the acquired metal profile. The distance between the strips of the frame should not exceed 60 cm. To continue work with drywall sheets, you will need the help of another person. The material is heavy and working alone with them will be difficult. Attach sheets to the frame with self-tapping screws every 20-25 cm. Heads go as far as possible so that they do not interfere with the application of the finishing layer. Installation of the first sheet, check the level. Subsequent sheets are set close to the first. Glue all the joints with a serpianka and apply a layer of putty. Simply installed sheets of drywall with embedded seams do not look very attractive. 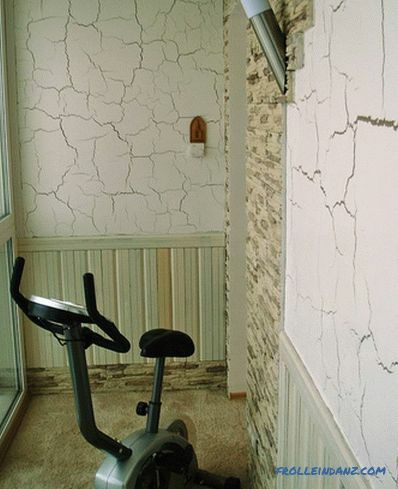 The walls have become smooth, but they are still far from beauty. It is necessary to apply a finishing layer. Drywall Before applying the plaster be sure to prime a good quality primer. Stir the desired amount of plaster and begin to put it on the walls with a spatula. The plaster layer must be even and not too thick so that you can wipe it down to the desired texture. 30 minutes after applying the plaster, proceed to wiping it off using a plastic grater. Because as you move the grater, the final result and the pattern on the wall depend. If you started to rub with rotating movements, then continue to do so until the end. The treated surface should be smooth, with a beautiful smooth pattern. 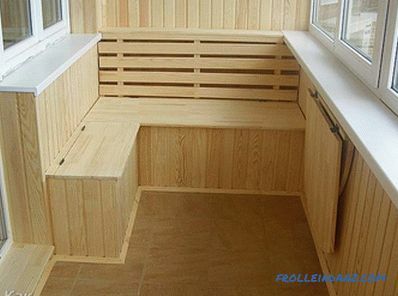 If you want to use As a top cover artificial stone, first make a project of your new balcony. Drawn sketches will help you achieve the desired result and properly plan the work with the material. 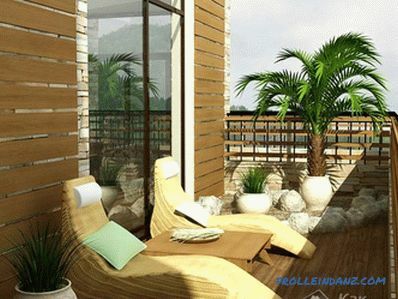 What will your balcony look like? It all depends on your imagination and effort. First drywall the walls with a primer. To glue the stone, use a good quality special glue. Apply glue to the back side of the decorative material using a notched trowel. 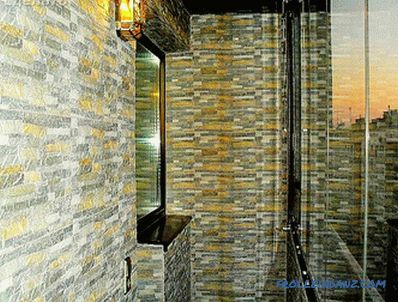 Artificial stone is perfectly combined with other decorative materials. The result is always pleased with its singularity and originality. Experiment. We talked about the different ways of covering closed-type balconies, but apartment owners do not always want to completely cover this small area. In this case, it makes sense to say a few words about the finishing of an open balcony. 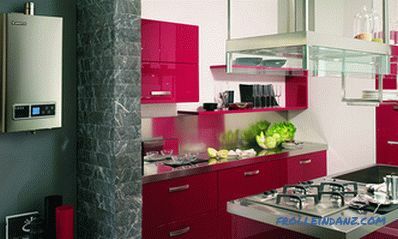 The main difference - the choice of decorative material. 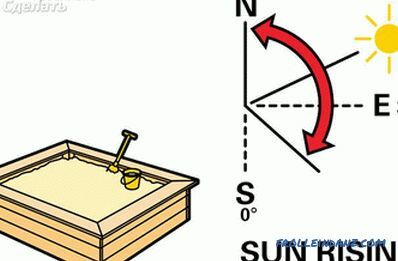 The open surface is exposed to the external environment: precipitation, temperature changes and the burning rays of the sun. The material chosen for finishing should have a high moisture resistance. Such characteristics have a tile and stone. A good option would be the choice of plastic panels. 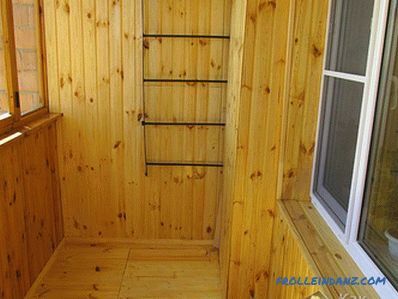 Most apartment owners prefer wood paneling. Using as a covering for natural wood will require additional costs from you. You have to definitely make a good defense. In addition to protection, the tree will need more thorough and painstaking care. Open balconies are mostly sheathed in stone. Having spent once a decent amount of money, you get a wonderful corner of rest for decades. 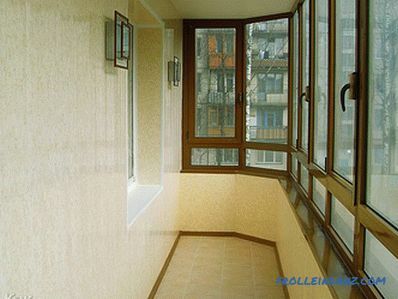 We told you about different materials and ways of covering the balconies. If you have something to add to the information obtained from the article, leave your comments. It is very important for us to know your opinion. From the video below you will learn how to sheathe the balcony yourself beautifully and quickly.